As interest in electric cars and renewable energy ramps up, a number of recent articles have highlighted WA’s status as a global hub for lithium production. A scramble by the lithium market’s biggest players to tie up supply of the high-tech metal is gathering pace in the 170-year-old heartland of Australia’s $90 billion mining industry. Rising Chinese demand for lithium-ion batteries needed for electric vehicles and energy storage is driving significant price gains and an asset boom in Australia, already the world’s largest lithium producer. The fast-developing hub is drawing investment and deals from global producers as well as chemical-to-battery manufacturers in China, the top consumer. Western Australia has four operations in production and three more major projects being advanced to begin output. Major players are likely to continue to scope for deals in the state to secure supply for the next 20 or 30 years, according to consultant Benchmark Mineral Intelligence. “There are serious companies investing and people are starting to lock up the biggest, long-life resources. The question is — who’s next?” said Simon Moores, managing director of Benchmark Mineral. Greenbushes in Western Australia, the world’s biggest hard-rock lithium mine, is being expanded to more than double annual capacity by Talison Lithium, a joint venture between China’s Tianqi Lithium Corp. and North Carolina’s Albemarle Corp. The site, first mined for tin around 1888, already accounts for about 30 percent of global lithium production, according to the Australian government. Tianqi is also planning approximately A$717 million of processing plant expansions. In May, Jiangxi Ganfeng Lithium Co., which holds about 43 percent of Australia’s Mt. Marion operation agreed a supply and investment pact with Pilbara Minerals Ltd. for mine development. In July, battery maker Shaanxi J&R Optimum Energy Co. struck an agreement for future output from Altura Mining Ltd.’s project. “It’s the most significant expansion in lithium supply ever, and we are still undershooting demand,” said Chris Reed, chief executive officer of Neometals Ltd., a partner with Ganfeng and Mineral Resources in the Mt. Marion operation. Also in July, Soc. Quimica & Minera de Chile SA, the world’s second-largest lithium supplier, made a first move outside South America to invest about $110 million for 50 percent of Kidman Resources Ltd.’s Mt. Holland project in Western Australia, with the aim of beginning production by 2021. Chinese companies plan battery factories with the capacity to pump out about 120 gigawatt-hours a year by 2021, more than three times the proposed volume of Tesla Inc.’s Gigafactory in Nevada, according to Bloomberg New Energy Finance. About 55 percent of global lithium-ion battery production is already based in China, compared with 10 percent in the U.S. By 2021, China’s share is forecast to grow to 65 percent. Electric cars will outsell fossil-fuel powered vehicles within two decades as battery prices plunge, Bloomberg New Energy Finance estimates. The world’s biggest car manufacturers are joining the race to secure raw materials, Galaxy Resources Ltd.’s Chief Financial Officer Alan Rule told reporters. “They want to talk to us directly, to get access to long-term supply,” he said. “They are really concerned.” Galaxy visited major Western automakers in recent weeks, some of whom have reviewed more than 200 lithium projects and developers, he said. 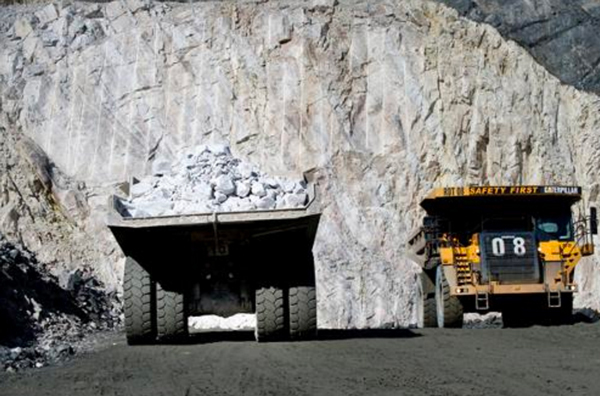 Mineral Resources Ltd. and Galaxy are Australian producers that this year began new shipments of lithium concentrate to China, while project developers including Pilbara Minerals are targeting exports from 2018. The project pipeline is cementing Australia as a dominant player, UBS said in a June report.